The catalogue for “Respublika! 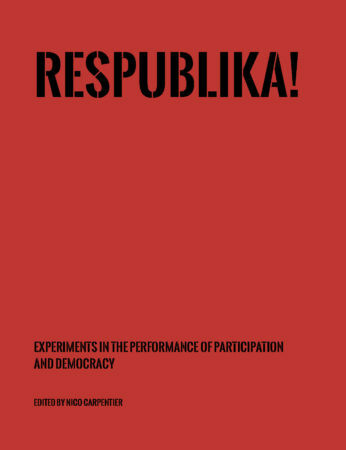 – Experiments in the Performance of Participation and Democracy” (2019), edited by Nico Carpentier and published by NeMe, reports on the Respublika! project, initiated and curated by Nico Carpentier and co-organised with NeMe and CCMC. The catalogue highlights the 18 Respublika! art projects, through project narratives, artist interviews and more than 200 photographs and can be accessed freely here. It also contains 12 reflexive articles, written by Bart Cammaerts, Nico Carpentier, Vuk Ćosić, Vaia Doudaki, Pascal Gielen, Helen Hahmann, Nicos Trimikliniotis, Olga Yegorova and Hazal Yolga. Respublika! was a cluster of an arts Festival, three Exhibitions and several Seminars, initiated and curated by Nico Carpentier and co-organised with NeMe and CCMC. Respublika! translated the principles of community media in creative practice, in order to reflect on media, democracy and its participatory component, to analyze the (de)centralization of power in contemporary societies, and to showcase art projects that use participatory mechanisms to produce art projects, working with, and empowering members of one or more communities. Respublika! was multi-sited and multi-genre, and aimed to tap into the creative reservoirs of community media, civil society organizations and social collectives (and their members); but also of artists that are committed to the basic principles of participatory (community) communication. second main exhibition, from 8 to 16 December 2017.
tagged with Cyprus, Cyprus Community Media Centre, NeMe, news, Nico Carpentier, Respublika!